We made it through the rain in California this week, but our teams across the country are preparing for a cold, snowy weekend. 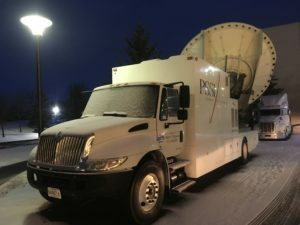 Through rain, sleet, or snow, wherever there’s live television, you will find PSSI Global Services! NT32 (with the Ku-band antenna stowed) and our 5.5m antenna in Kona, Hawaii. Why don’t we start where nobody can complain about the weather? 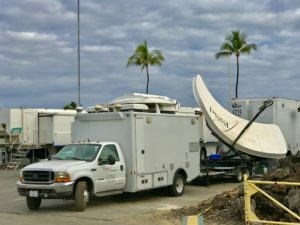 Craig Henry and Todd Harvey are well underway at Hualalai Golf Club in Kailua Kona, HI, where we’re providing transmission services for Golf Channel’s broadcast of the 2019 Mitsubishi Electric Championship. This tournament, which is part of the PGA Champions Tour, is our last stop in what has been a solid stretch of work across the Hawaiian islands since December. Craig and Todd will pack up our truck and equipment in Honolulu storage, but our newly upgraded NT32 truck will remain available as a turnkey solution for any transmission needs in Hawaii. It’s also not too bad for Chris Golden. 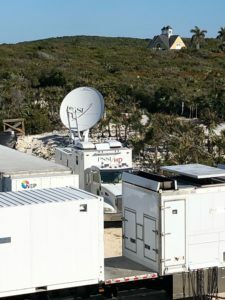 After finishing up a great week at The Great Exuma Classic at the Sands Emerald Bay Golf, Tennis and Spa Resort, Chris hopped on a plane over to Great Abaco to meet up with the C24 truck for the Great Abaco Classic in Marsh Harbour, Bahamas. Thanks to Chris for the great work on this extended road trip. Please come back when you’re finished! C24 on holiday in the Bahamas. Back in Florida, Kevin Spangler and the C31 truck are at Tranquilo Golf Club in Lake Buena Vista for the official start of the 2019 LGPA Tour season at the Diamond Resorts Tournament. The world’s top pro female golfers will compete for a prize pool of $1.2 million. Kevin’s got another week in Orlando after this, as he’ll be running the same truck at the PGA Merchandise Show for our friends at Golf Channel next week. We will also have PGA Demo Day next week in Orlando, and here we’ll have Jonathan Ayala running the C21 with Tracy Michaels serving as Tech Manager for the entire production. Our Golf Channel team does it all, and we are thrilled to be back into full swing across the country (and beyond). Back in California, Joe Cox is in the middle of a great week of transmission services at PGA West Golf Course in La Quinta. It’s the 2019 Workday Desert Classic (formerly the CareerBuilder Challenge), where top PGA competitors do their best to earn a share of the $5.9 million prize pool. 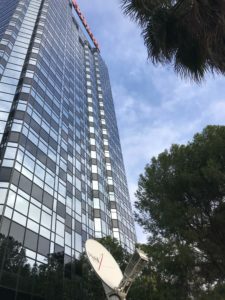 K34’s antenna at the base of the Hilton in Universal City. Let’s stay in sunny California before we brave the busy winter weekend in the Northeast. John Bright and Alex Mestizo are providing full production and transmission services for our friends at ESPN for another round of MLS Media Days. John and Alex have our K34 production/uplink unit (along with the support truck) all set up at the Universal Hilton in Universal City for a multi-camera production that will feature 30 of the top players from all over Major League Soccer as they give interviews and press conferences in anticipation of the final two rounds of the MLS draft on Sunday. John Jennings and the Atlas truck will be at the Rose Bowl in Pasadena, CA on Sunday for Fox’s broadcast of the 2019 NFLPA Collegiate Bowl, which will showcase draft-eligible college players for scouts, coaches, and fans of the NFL. Wes Hill will take that same truck down to Torrey Pines in La Jolla, CA for the Farmer’s Insurance Open. He’ll park in set up on Sunday for a week’s worth of transmission services for our friends at Golf Channel News. Sacramento-based Steve Chaisson is also down in Southern California for the big rivalry game between the UCLA Bruins and USC Trojans on CBS Saturday afternoon. Our News Group guys are busy in LA, too. David Conwell and Al Meshberg will be in downtown Los Angeles this weekend to provide CNN with coverage of the 2019 Women’s March. Mark Huss setting up for ringside international commentary services at MGM Grand. That takes care of our California crews. Our team in Las Vegas is also plenty busy. It’s a pay-per-view weekend at the MGM Grand Garden Arena, and our Strategic Television PPV crew is getting all set up for fight night. 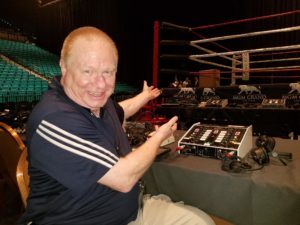 Earlier in the week, Paul and Brian Blomstrom uplinked press conferences and media tours with the fighters, with the PSSI International Teleport (PIT) providing closed captioning services remotely. For the fight itself, EIC Tracy Michaels has made sure our three event trucks are positioned perfectly to provide our friends at Showtime with multiple, redundant transmission paths for domestic and international broadcasts, with thorough testing on Friday. The CK35 mobile teleport is the transmission hub, with all inbound and outbound feeds displayed on the monitor wall so that project managers Michael Hollander and Victor Verno can keep an eye on every minute of the action. Senior engineers Paul Blomstrom, Brian Blomstrom, and Matt Huennekens are also there to ensure a flawless broadcast as Manny Pacquiao battles Adrien Broner for the Welterweight World Championship in the main event. We also have some exciting undercards that will entertain boxing fans around the world. Engineer Mark Huss is also on hand to provide extensive unilateral commentary services for broadcasters from Japan, Mexico, and the Philippines. And don’t forget the PSSI International Teleport, who will be providing international turnaround services from Pittsburgh. What a great crew, and what an exciting fight! Rick Kolinek and the K22 truck will be at JQH Arena at Missouri State University in Springfield on Friday and Saturday for the 2019 Bass Pro Shop Tour of Champions High School basketball Tournament. It’s two full days of exciting basketball action that includes teams from around the country. Mike Sheehan might win the company’s prize for coldest uplink engineer. This past week he was in Regina, Saskatchewan for the Saskatchewan-Manitoba Junior Hockey Leagues Showcase. He’ll continue his adventure across the tundra next week, as he moves 250 miles north of Regina to North Battleford for still more hockey. Mike is still getting the hang of his Celsius-to-Fahrenheit conversions, but it’s likely his thermometer will freeze up anyway! More Women’s March coverage for our News Group teams in the Northeast. Dustin Tanner will be on hand in Washington, DC, and new PSSI News Group employee Connie Yen will be working the March in NYC. Welcome, Connie! Chris Stewart will round out CNN’s multi-city coverage of this nationwide event this weekend. There’s a whole lot of college basketball on our schedules! Steve Hagerty and the K18 will be at the Carrier Dome in Syracuse, NY on Saturday when the Syracuse Orange take on the Pittsburgh Panthers. Also on Saturday, Dave Buckman and the Columbia truck will be at Christl Arena in West Point, NY for a doubleheader that will feature the Army Black Knights playing the Navy Midshipmen. Dennis Smith and the NT21 will be at Liacouras Center at Temple University in North Philadelphia on Saturday when the Penn Quakers take on the Temple Owls. From there he moves across town to Hagan Arena at St Joseph’s University, where the Saint Joe’s Hawks women’s basketball team faces off against the La Salle Explorers. Mati Kerpen and the NT34 will be at Gampel Pavilion at University of Connecticut in Storrs on Saturday when the UConn Huskies defend their home court against the Tulane Green Wave. The university moved up the start time of the game due to weather, so Mati’s going to wear his snow boots! C42 in snowy Verona, NY. It’s likely Nick Ray’s going to see a snowflake or two. He’ll be at the Turning Stone Casino in Verona, NY on Friday for ESPN/Top Rank boxing when Bryant “BY” Jennings puts his IBF International and NABO heavyweight belts on the line in a 12-round matchup against undefeated NABF champion Oscar “Kaboom” Rivas. Nick will be providing a multiplexed transmission for our friends at ESPN and ESPN Deportes. Tight quarters in NYC for Friday night’s DAZN fight. We have two big fights in NYC this weekend. 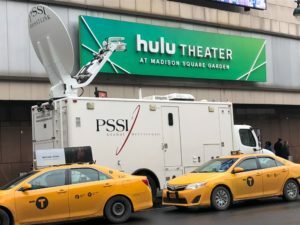 First up is Rick Varney and the C45 truck at Madison Square Garden’s Hulu Theater, where he will be transmitting multiple paths for our friends at Aldea and DAZN for World Championship Boxing on Friday night. Demetrius “BooBoo” Andrade will try to defend his WBO World Middleweight Championship against Artur Akavo. We do it all over again for another DAZN fight in Houston next week, and hopefully many more to come throughout the spring and summer. Over in Brooklyn, we are excited to be providing transmission services for the inaugural UFC on ESPN+ event. It’s business as usual for us as we continue our long, valued partnership with Concom, but we are very pleased to be delivering the UFC action to our friends at ESPN for distribution on their digital platform. On Thursday, senior engineers Jim Flowers and production specialist Mike Lemieux were in the newly upgraded and modified NT22 to provide Concom with a three-camera production of the pre-fight presser, live from Brooklyn. Now it’s time for the fight. Blake Blomstrom drove the CK25 mobile teleport into the city early Friday morning to meet Jim Flowers to prepare for Saturday night’s UFC Fight Night 143. The main event features Henry Cejudo fighting TJ Dillashaw, while the co-main events will have Greg Hardy facing off against Allen Crowder, and Gregor Gillespie fighting Yancy Medeiros. Strategic Television project managers Keith Valeri and Garrett Hunt are also on hand to ensure clean transmissions to domestic and international takers. With so many new digital platforms, we are pleased to remain a key player in live event distribution. Our engineering and project management teams are second-to-none, and all of these changes are keeping us busy as we develop new strategies and technologies to stay ahead of the curve. Onward!